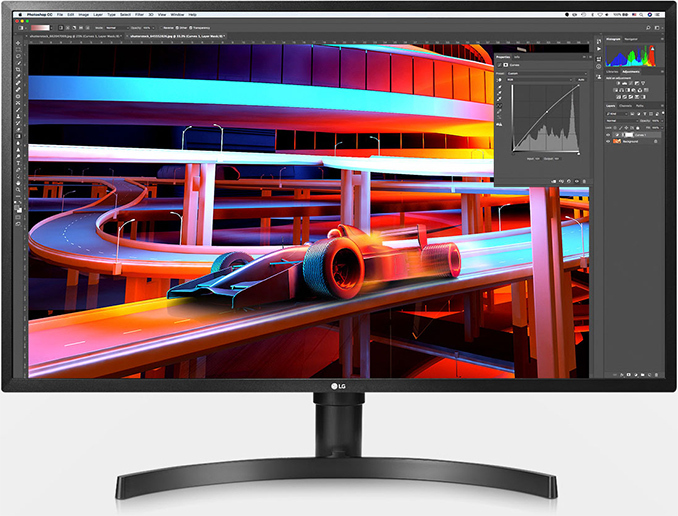 LG's new gaming monitor 32UK550-B has some technical features that make it interesting for working with video as well - apart from the fact that it is quite inexpensive with a price of about 500 dollars: its factory color-calibrated 4K UltraHD 31.5" VA panel covers 95% of the professional DCI-P3 and 100% of the sRGB color space. It supports besides HDR10 also AMD's FreeSnyc with a frequency range of 40-60Hz and has a DisplayPort 1.2 and two HDMI 2.0a interfaces. The viewing angle is 178° horizontal and vertical. Unfortunately there is no "real" HDR (also a higher brightness) at the absolute average brightness of 300 nits. The LG 32UK550-B will be available in Japan in October for the equivalent of 485 dollars - a little later it will also be available in this country.